This hose is rated at 240 psi and is used for food and alcoholic beverage suction and discharge; specially designed for wine, beer and spirits, up to 95 proof. The tube material is white nontoxic CIIR, which meets FDA and 3A requirements. Hose is reinforced using high tensile textile cords with embedded PET helix. The Grey EPDM cover is abrasion and ozone resistant. 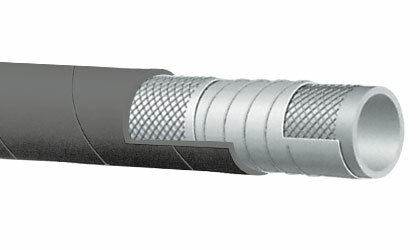 The T410LB hose is available in 1", 2", and 3" ID sizes. Click here for more info.